It’s no secret that Spanish cuisine is a key reason it’s the UK’s number one destination. Yes, there’s the beaches and weather too, but the tradition of nibbling on a tableful of tapas washed down with a glass (or two) of sangria is a big part of the lovely, lasting memory. While the Spain’s cultural capital Barcelona has earned a reputation for restaurants that are cut above the rest, the actual capital of Madrid is quickly catching up. The question is, what happens if you cut out the main dishes of tapas and go vegetarian-only? If there’s no chorizo and calamari is banned, usually vegetarians are left with patatas bravas (fried potato cubes with aioli and tomato sauce, as if you needed telling) and padron peppers. No complaints, but my, it turns out there’s so much more in Madrid. In betwixt a wonderful weekend of parks and paintings (you’re a stronger person than I if Picasso’s Guernica at Museo Reina Sofia doesn’t move you to tears), here were some of the plant-based highlights…and the reasons I rolled home in need of a gym afterwards. When is it too early in the day for cocktails? Never, that’s when. So on a glorious autumnal lunchtime in Madrid, my vegetarian sister and I peruse around the shops near Plaza Mayor before finding Rosi La Loca on a side street. And you can’t miss it: if the weekend lunch queue spilling out the door doesn’t give it away, the oversized decorative flower stumbling down its façade will. Convivial and cosy, we eye up everyone’s dishes as we make our way downstairs to the lower floor, which is a little more relaxed in atmosphere but just as magical in décor: think Alice in Wonderland meets Club Tropicana, with wild light fittings, wall decorations and things hanging off other things. Clearly, Rosi has a bold and distinctive character, which bodes well for the meal. So, to the cocktails. I order a Gin Tea Mai and it’s served Tiki style: in a faux-eggshell cup that rests on a bed of pink feathers inside a nest/basket. Such theatre again foreshadows the meal – one that’s well-priced with each dish around €7 (and the changing set menus are even better value). 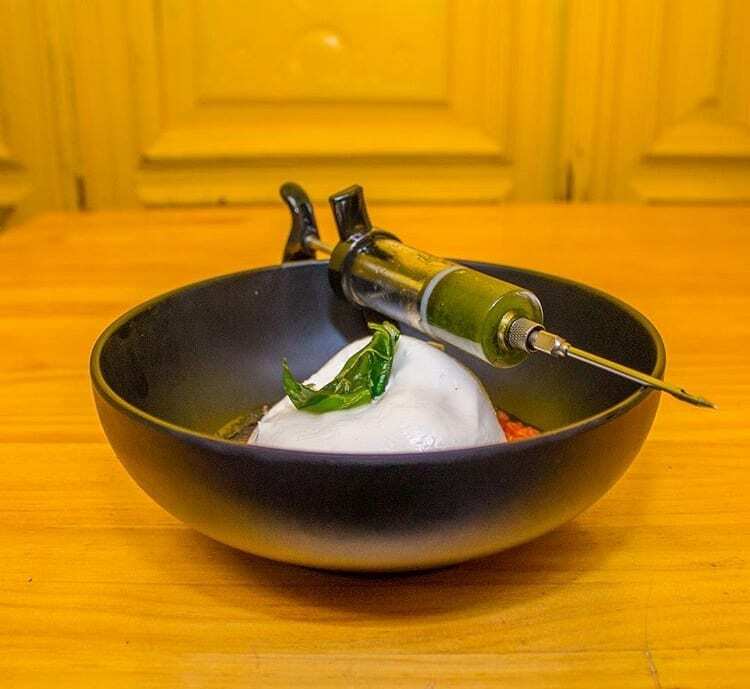 Run by Javier Alfaro, there’s clearly a creative at work in the kitchen. The tasty beetroot and tomato gazpacho, scattered with tiny bursts of pineapple chunks, is served inside a bowl of dry ice; I’m invited to inject a humongous ball of burrata with a flavoursome pesto (which we soon devour alongside tomatoes and fresh bread); there’s aubergine crisps are nicely drizzled with molasses and balsamic vinegar; and the intensely-flavoured open lasagne is presented with a dramatic brush of tomato across the dish is as beautiful as the art found across Madrid. By the time dessert of a light and airy cheesecake arrives, we’re both happy and satiated – and not missing meat at all. There’s a decent amount of vegetarian restaurants in Madrid, but only a few that maintain the ambience of a higher-end eatery. Superchulo is one of them. Found in the hip neighbourhood of Malasaña, its reliance on returning customers for trade means the standard is going to be solid. 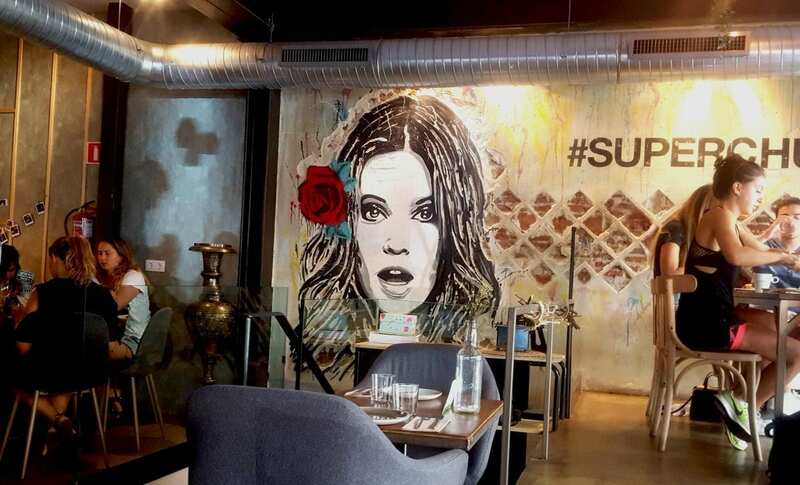 Covered with an upside-down garden on the ceiling and a street art mural drawn on its back wall, the space is bright and airy, which already makes it unusual and funky – my kinda restaurant. The vibe changes from this weekend afternoon feel though: evening time is where it gets buzzy, and downstairs houses a cocktail bar and stage space. It’s my kinda menu too. Superchulo doesn’t advertise itself as a vegetarian menu and nor should it. Steering clear of the standard veggie dishes, taste reigns supreme here. 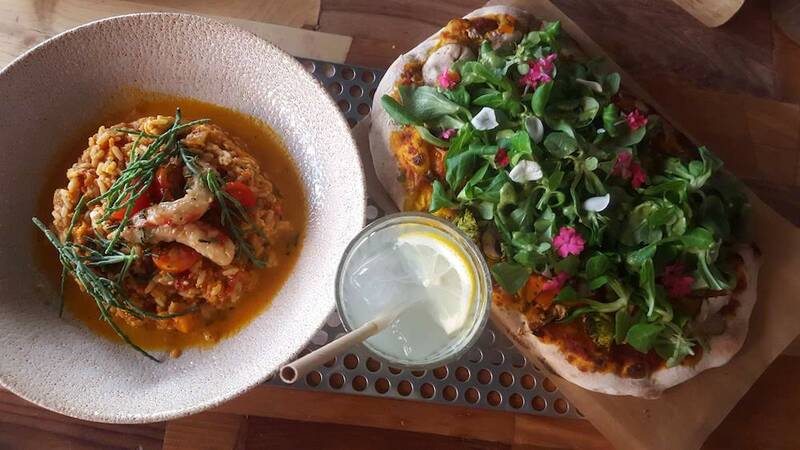 The dishes we sample are global-inspire doptions, like a flower power pizza beautified with colourful flowers and light and lovely tempeh and tzatziki bao. Having been in Madrid for 48 hours without sampling paella, it’s glorious to try [Mar]imorena rice: paella-style creamy rice with turmeric, seaweed, feta and soya prawns with a firm bite that are a great impression of the real thing. It’s impossible to resist the soft corn tacos even though we barely have any room left. Service is fab too – these dishes are savoured over a long and indulgent meal and made for an exceptional lunch out. If this came to London, I’d be here all the time. On Saturday night in Madrid, the city is at its most awake. If people aren’t returning from the shops with their day’s purchases, they’re heading out for the night and leaving a tinge of excitement in the air as they pass. 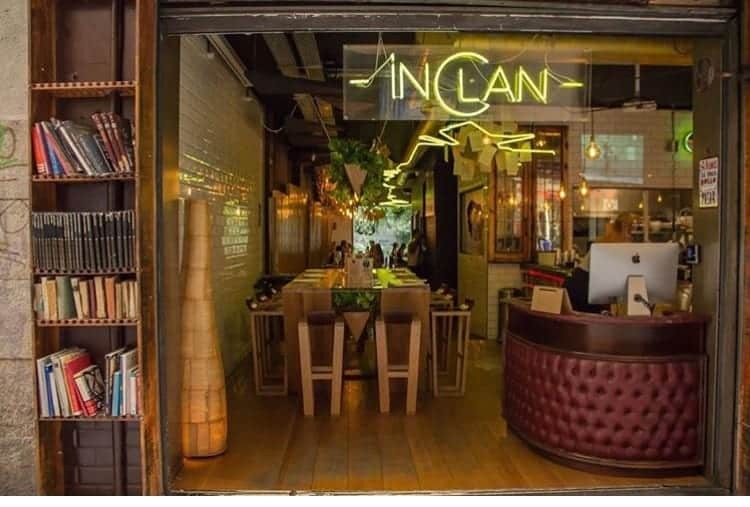 It’s in this weekend frame of mind that we head to theInClan Brutal Bar. Unique name, unique concept. In a busy pedestrian street full of restaurants, clubs and bars, it looks like any other fast-turnaround bar, but it’s not as it seems from the outside. Which is the very theme of the establishment. 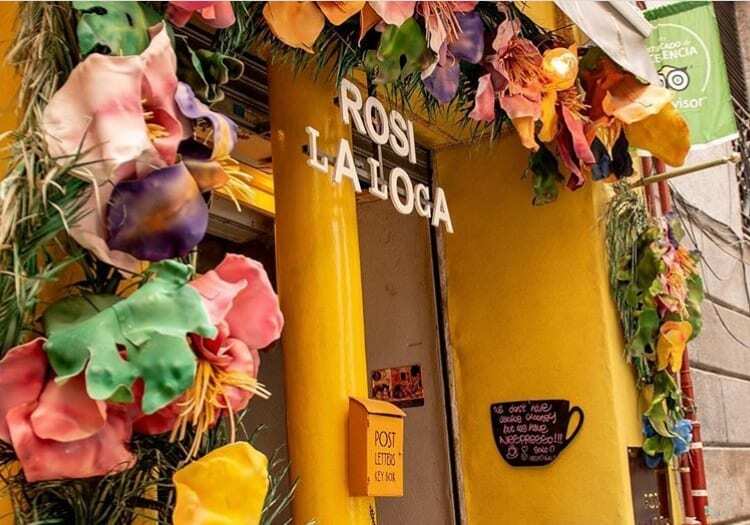 Owned by the same folks behind Rosi La Loca and with the same emphasis on competitive prices, there’s a few overlaps in the menu but it’s defined by the differences. 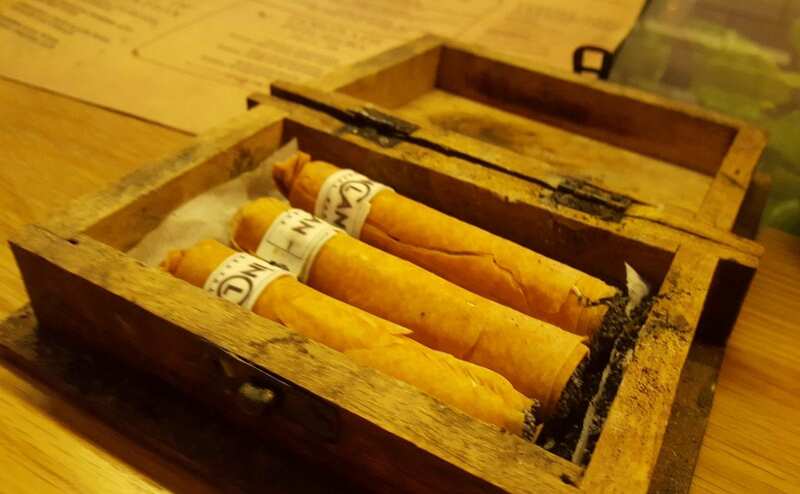 We’re first served a cigar box, inside which are branded cigars on a bed of ash. They look like the real deal, except they’re made from a thin cacao wafer filled with soft cheese – and the bed of ash is in fact cacao crumbs. Then we get shiny tomatoes served with the traditional Spanish sauce of salmorejo (made of garlicky tomatoes) – except the tomato is around of painted cheese – no wonder it’s called ‘Box of ‘this is not tomato’ on the menu. Even the risotto is actually made from orzo pasta. Expert mixologist Rubén Valero is on hand to whip up some incredible cocktails and he’s just as inventive. They infuse their own spirits, so once we’ve picked a flavour type (floral, citric, exotic or fruity)- my sister wants a citric cocktail, I want a fruity one – it’s playtime for Rubén.He uses a fruity vodka as a base for my sister’s cocktail, and a citric vodka for mine, because why make life easy for yourself, ammiright? By the time dessert rolls around, we know better than to think the peach is a peach – and it’s actually rice pudding. Especially for those who eat with their eyes, it’s a hugely entertaining meal.